I know. This might be controversial. This might be wrong in some way, but regardless of his personal end and the atrocities he committed, Chris Benoit is still one of the best wrestlers we witnessed in the WWE, WCW, and period. Before the horrific events that occurred 9 years ago, Benoit was known as one of the best technical wrestlers in the world and possibly the best ever. His submission style wrestling, his ability to ground and pound in the ring, and even do some high flying is what made him such a pleasure to watch in the ring. Today, with a bit of hesitancy, we talk the top 5 matches Benoit had in the WWE. -This is honestly one of the greatest matches in RAW history. There's nothing like this one. 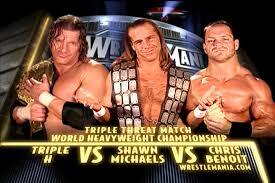 Triple H and Austin were the Two Man Power Trip, and while they were on a roll, so were Benoit and Jericho. This contest was everything I expected and then some. As the team of Austin and HHH tried mightily to hold onto to their titles, Benoit and Jericho proved to be too much for them to handle. HHH would take his infamous injury and finish the match, a testament to his true toughness. This match might be my personal favorite tag team of all time honestly, as it is one of the best matches I've ever witnessed on RAW and ranks as a top 5 or top 10 matches in each man's career that was in it. -The Finals of the Smackdown tag team title tournament came to this. Rey and Edge were a great team together and in my opinion, Angle and Benoit were the best wrestlers on the roster at the time, and in their WWE primes so this was definitely something special. The two teams fought and battled each other with everything they had, but it would be Angle and Benoit walking away with the victory here, yet another successful tag team title win for Benoit on this list. -This was an epic match. 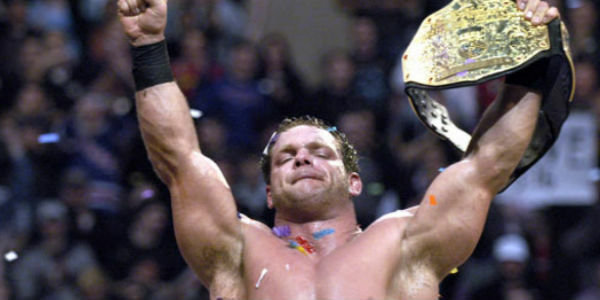 I'd consider this Benoit's shining moment, and the match that showed he had what it took to be in the big time. Austin was the WWF Champion and a heel, and Benoit rolled into his hometown in Canada ready to walk away with the title and vengeance. However, with Vince McMahon swarming around ringside, Benoit didn't really have a chance. Epic moments like the multiple German suplexes, the crowd behind Benoit firmly, and the ending sequence with Vince getting involved, allowing Austin to get the quick pin was so entertaining. Even in a losing effort, he put forth one of his best performances. -This match is superb. I think it's one of the all time great WWE Title Matches and probably the most slept on title match of all time. Benoit and Angle put on a 20 minute classic that saw them pull out all the stops. I remember watching this and rooting for Benoit and he was so close to winning the title from Angle. Angle eventually gets a submission victory, but it took everything he had to beat Benoit. This match would be another turning point for Benoit as he ended up receiving a standing ovation from the crowd after the match, an ultimate sign of respect. 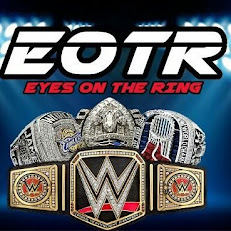 -This is honestly one of the top 10 Wrestlemania main events period and probably top 5 in reality. Shawn, Benoit and Triple H put on a true classic and left it all in the ring. Benoit and Shawn had amazing chemistry and though at first I didn't like Shawn being included, but man that was the right call. Benoit ends up walking away with the victory after pulling off an amazing feat..... making TRIPLE H TAP OUT!!! That's one of the greatest Mania moments ever, and regardless of anything else, it is the greatest moment in Benoit's career. Do you see any matches missing or did you have a different selection? Tell us in the comments below.